I have had Grandfather’s box of papers for a couple of years now. I’m still trying to understand what they all mean. Along with a priceless collection of birth/death and marriage certificates for his family line, there are fragments of stories, transcriptions of historical documents, handwritten drafts, and carbon copies of typed letters. They often lack addresses or return addresses or dates so I’m not always sure if they were letters he was sending or receiving or someone else’s correspondence entirely. Most of these documents are written in Hungarian or Latin. But there is one German letter. I can tell that it is a request for a copy of the marriage certificate of his parents in Pula, Austria (now Pola, Croatia) in 1885. But I didn’t know what the rest of the letter said. I tried transcribing the document and feeding it to Google Translate. Unfortunately, Google gagged on the letter and returned digital barf. Fortunately, there are Angels waiting on the Facebook Genealogy Translations Group. I posted the letter and minutes letter got a response. Me: OMG! I thought that was part of the motivation for his genealogy research. Grandfather owned a typewriter store. So it would be especially important for him as a business owner. I can’t imagine living through that horrible time. Thanks to you both for your help!! So my grandfather with his poor German grammar wrote this letter requesting an urgent response shortly after the German invasion of Poland. He did get a copy of his parent’s marriage certificate. As far as I know the family still kept their store and home through the war. His properties were confiscated by the Communists after the 1956 Hungarian uprising. My grandparents emigrated to Canada in 1957. Simple documents, when you have the historical context, can reveal so much about the lives of our ancestors. I think I will keep a special folder for the images of my grandfather’s correspondence. I will cite this letter to confirm his place of residence at the time, and then move on to the next mystery in his box of papers. My (Australian) daughters’ grandfather was Sigmund Orban (Polish) who disappeared after he returned to Poland after the end of WWII. His German defacto wife and baby son (born 1946) never heard from him again. The couple were unable to marry in Germany at that time (different nationalities) nor could they emigrate (not married). So he returned to Poland to prepare a new life for the family after receiving a letter from his father encouraging him to come home. 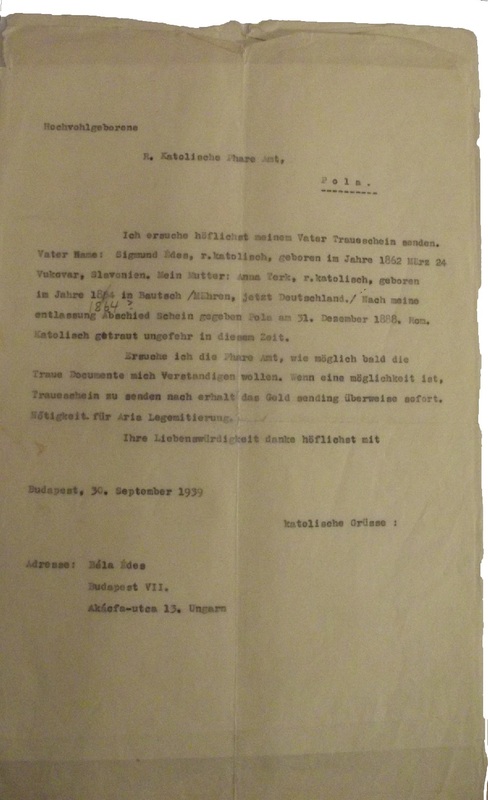 His German ‘wife’ (who had spent most of the war in a concentration camp) suspected that the letter was written under duress by the authorities who wanted to lure him home. She believes he must have been killed. Do you think this man may be related to your family? Margaret, Thank you for writing. What a tragic story! There was so much brutality in the war. My Orbáns are Székely/Hungarian from Transylvania. I’m guessing that Sigmund was born sometime around the 1920s. There is no match in my family records so I don’t think it is likely we are related. Orbán is a fairly common name in Hungary. Do you have any more information about him? There is a Polish genealogy group on Facebook that might be able to help. I’m so sorry for your family.